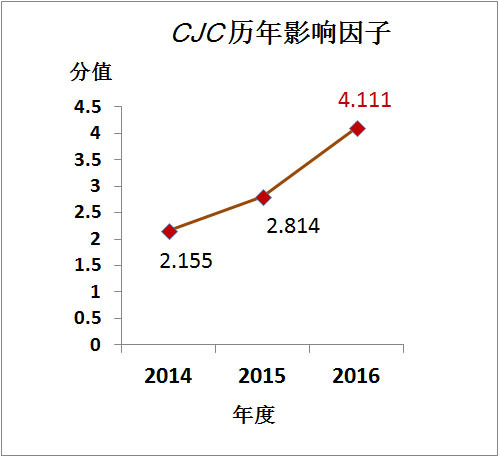 We are pleased to announce that the 2016 Impact Factor (IF) of Chinese Journal of Cancer (CJC) is 4.111 according to the Journal Citation Reports released by the Clarivate Analytics on June 14, 2017. The journal is now one of the most influential SCI journals in the second quartile (Q2), and ranks at the top of oncology journals in mainland China. CJC is sponsored by Sun Yat-sen University Cancer Center, China and published monthly by Springer-Nature Publishing Group (BioMed Central). As a prestigious international journal on oncology, it is indexed/abstracted in Science Citation Index (SCI), Medline/PubMed, PubMed Central, Directory of Open Access Journals (DOAJ), Scopus, and so on. CJC publishes peer-reviewed scientific articles in the areas of basic, clinical, and translational cancer researches. All articles published on CJC are open access. We would like to present our most sincere thanks to all authors and reviewers who contributed to CJC by providing outstanding manuscripts and high-level professional review comments. We are looking forward to your continuous supports to promote greater improvement of CJC.